Prisoners locking their own cells and having laptops in a bid to create a respectful environment at the UK's largest prison has been a "complete and utter disaster", it has been claimed. 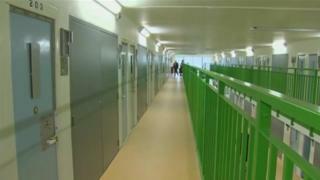 The Prison Officers' Association (POA) said staff needed to be safe at HMP Berwyn before such moves can work. The approach has been in force since the Wrexham jail opened in 2017 but assaults on staff have been high. The Prison Service pointed to a positive independent report on Berwyn. Wings at the category C prison are known as "communities", cells are "rooms" and prisoners are called "men" as part of the approach. The ability to lock cells with guards adopting a "knock first" policy does not apply overnight and can be overruled at any time if there is an incident or a search. But Mark Fairhurst, national chairman of the POA, said knocking first "never happens". He added: "Experienced prisoners will take advantage of the softly, softly approach and that's why Berwyn has got one of the highest assault rates on staff. "We need to get back to basics. You can't rehabilitate anyone unless you have change. "We need to get it safe and support the staff and take back control." Mr Fairhurst said conditions had improved over the past few months since a new governor started. Andrew Neilson, director of campaigns at the Howard League for Penal Reform, said: "This sounds like a positive way to build good staff-prisoner relationships and, if it contributes to a safer and more respectful environment, that is a good thing. "Ultimately, at the root of Berwyn's troubles is the fact that the prison is far too large. "Even though it is still only half full, there have been constant problems since it opened." In response, the Prison Service highlighted last year's Independent Monitoring Board report which said there were "many examples of good and innovative practice".